Homemade mayo offers flavor and texture unmatched by the store-bought stuff. It’s also a finicky sauce that requires a perfect emulsion. Who knew an immersion circulator would help you make mayo so easy and delicious, you’ll never buy the jar again? James Peterson just released the fourth edition of his essential technique book . Paging through the thicker tome (now 666 pages, up from 500 in the third edition), you’ll immediately notice full-color, technique-driven photography breaking out step-by-step guides to several recipes. Not only does Peterson provide fantastic recipes, he writes with clarity and accessibility about why each recipe works. Reading, and cooking through, his book offers a true practicum in modern and classic sauce making, and the updates within this edition make it a kitchen staple well worth investing in again. Peterson’s chapter on mayonnaise had me eager to try his technique for stabilizing egg yolks (p. 417). Neither of my arms will soon forget whisking mayonnaise in culinary school. We always did it by hand and desperately hoped the sauce would not break. Spending ten minutes whisking egg yolks into oil and then watching your sauce break is certainly not the worst kitchen heartbreak, but it isn’t fun. 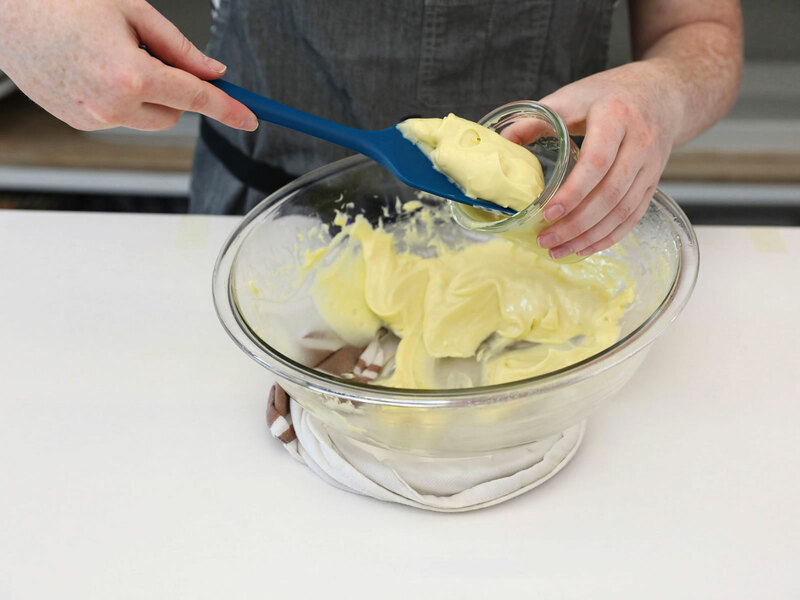 With stabilized egg yolks, you’ll get beautifully thick and flavorful mayonnaise every time, no practice required. Here’s the trick: slow-cooking the yolks in a water bath. 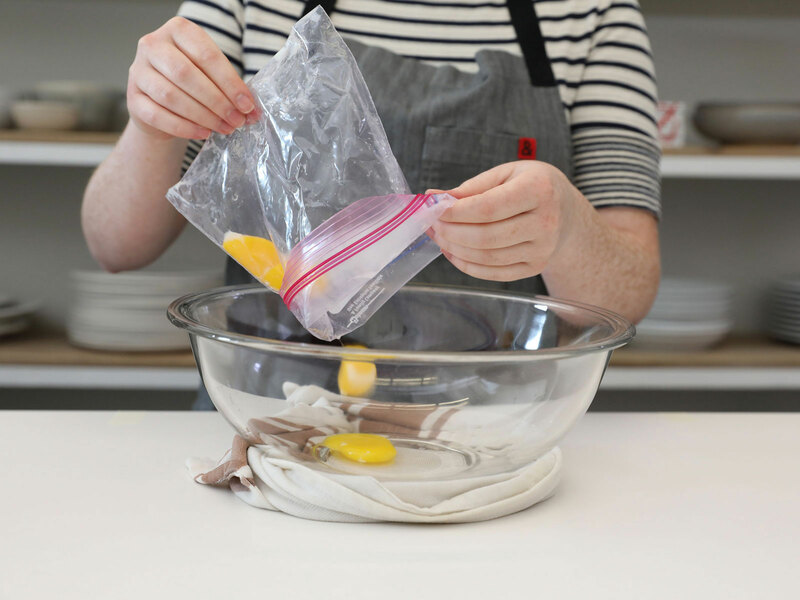 Cooking the egg yolks in a plastic bag using an immersion circulator stabilizes them, which allows you to successfully emulsify your mayo every time and means it won’t break going in and out of refrigeration. No immersion circulator? You’ll need a very accurate thermometer (we like the ) and the patience to stand by your stove adjusting the heat for 30 minutes. Step 1. 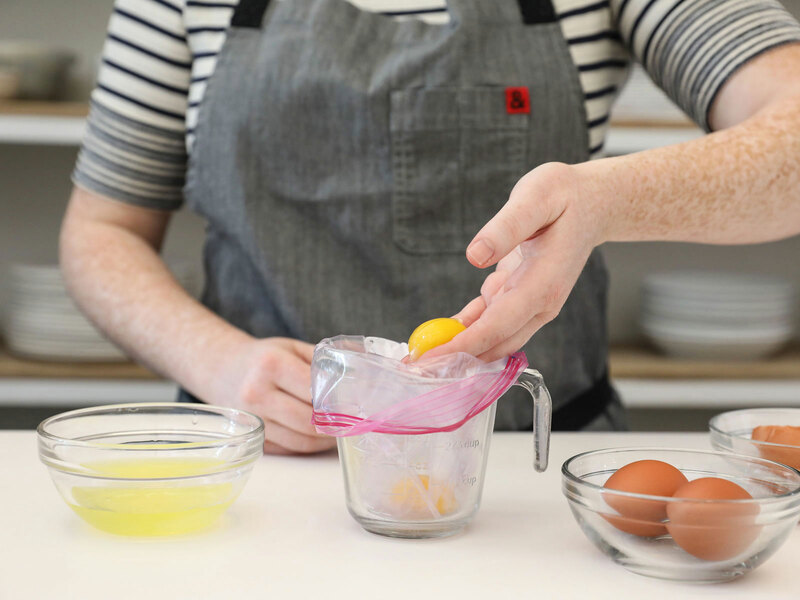 Separate your eggs and transfer the yolks to a BPA-free plastic resealable baggie supported by a measuring cup. Save the whites for pavlovas, omelets, or some holiday cookies (perhaps macarons?). Step 2. Set up a water bath in a heat-proof container. Affix the immersion circulator and heat the bath to 140°. Submerge the baggie in the water bath, allowing the air to escape the bag before sealing it and securing it to the side of the bath with a clip and pair of tongs. Cook the egg yolks for 30 minutes. Step 3. 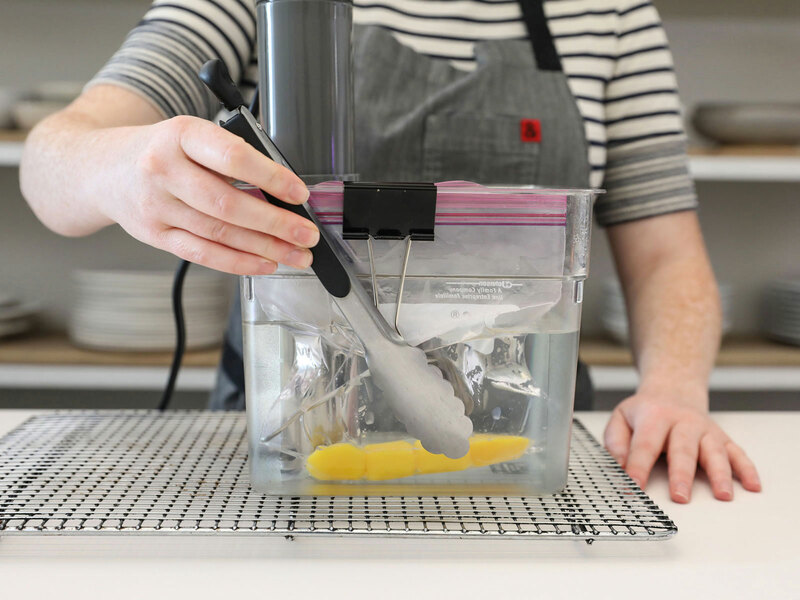 Remove the yolks from the water bath and transfer to a large glass bowl. 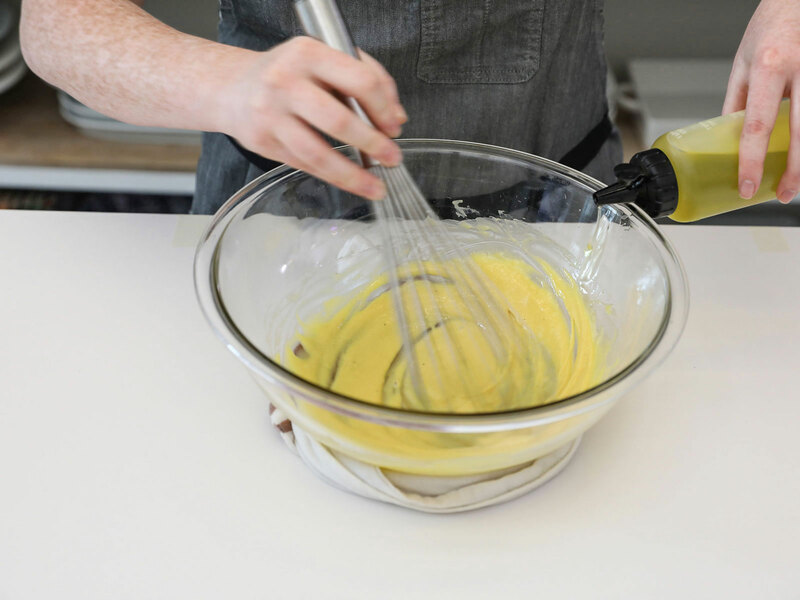 Whisk the yolks with salt, pepper and vinegar until smooth. Step 4. Whisking constantly, very gradually add the oil 1 tablespoon at a time, until the sauce is thick and emulsified. And, there you have it: mayo! Since the yolks are stabilized, your emulsion should come together easily, and won't break going in and out of the fridge, either.